My sister was joining us for a late dinner, I had figured out I was making roasted fingerling potatoes with rosemary and honey chèvre, but that was as far as I had progressed. 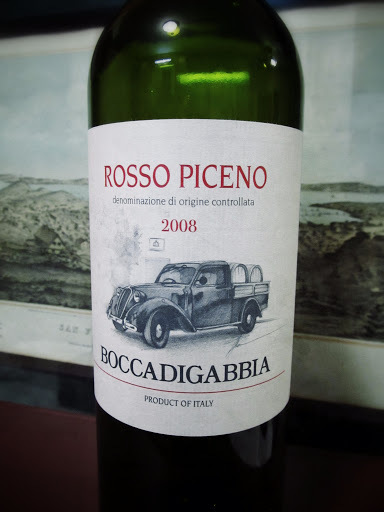 Clearly a glass of wine would assist in brainstorming the rest of dinner, so I popped open Boccadigabbia Rosso Piceno 2008. The Boccadigabbia estate was previously the wine growing portion of land owned by the Bonaparte administration, during which time French varietals were introduced and produced. In 1956 the Boccadigabbia portion was sold by the Bonaparte family to the Alessandri family, who have carried on the winemaking tradition initiated under the Bonaparte régime; adding indigenous Italian varietals alongside the French Pinot Noir and Cabernets. Today, Elvidio Alessandri along with his son Lorenzo has established Boccadigabbia as one of the top estates in the Marche region. The estate is certified by the strict environmental standards of the Marche Region. Organic fertilizers are used, but only if absolutely necessary, and they utilize minimal amounts of sulphur in their wines. The Rosso Piceno DOC blend is their most popular red wine. Deep red violet in colour, aromas of cherry and dried violets radiated from the glass. Tart cherry and pomegranate flavours were entwined with bright mint elements and supported by black tea tannins in the medium body. White pepper, fresh anise and hints of river stone minerals comprised the lengthy finish. Fruity, herbaceous and pleasantly dry, this is a wonderful glass that enjoys accompanying a meal.